salvage drum regulation | Drum It Up! What is a Salvage Drum? 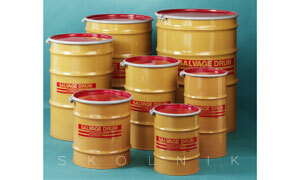 Salvage drums are designed to contain leaking, damaged or non-compliant drums containing hazardous materials. If a company or shipper discovers a hazardous package leaking or damaged or has rags used to clean up a spill or leak, they must use a salvage drum in order to safely transport the package or materials. Salvage drums can be made of steel, polyethylene, aluminum or metal and must be larger than the leaking package so that the damaged and dangerous materials can fit safely inside of the enclosed salvage drum. In order to qualify as a salvage drum, the container needs to meet a number of criteria and pass two very severe leak-proof and integrity tests. What is an Overpack Container? The DOT does not consider overpack drums as salvage drums. Traditionally, an overpack is a container that makes handling a package more convenient or consolidates two packages that are not leaking. Many manufacturers have referred to salvage drums as overpacks over the years, increasing the recognition of the term overpack versus salvage. However, while you can use a salvage drum as an overpack container, not all overpack containers are salvage drums. Remember, salvage drums have undergone rigorous testing in order to be deemed qualified for their use containing hazardous materials. A drum that is merely labeled as an overpack, has not. The unwitting misuse of an overpack drum as a salvage container can have dire consequences so make sure you are always purchasing and/or using the correct drums when transporting hazardous materials so as not to compromise your safety and the safety of others. At Skolnik, we offer Overpack Salvage Drums – these meet or exceed the UN and DOT requirements for Salvage drums but can also be used for overpack.